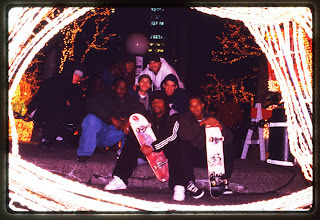 here's a photo that came out of the archives, i believe this was shot in '95 MIKE WRIGHT, GIZ , RODNEY TORRES, MIKE BELL, SHELTER SERRA. 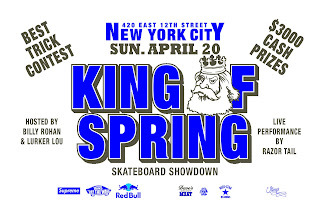 BILLY ROHAN PUT TOGETHER AND AMAZING EVENT, FIRST CONTEST OF THE YEAR IN NYC WENT OFF. SUN WAS OUT, ENERGY WAS HIGH AND EVERYONE WAS RIPPING. JEFF PANG, SPENCER FUJIMOTO AND I GOT TO JUDGE THE CONTEST GIVING MONEY OUT TO EVERYONE THAT WAS LAYING IT DOWN. 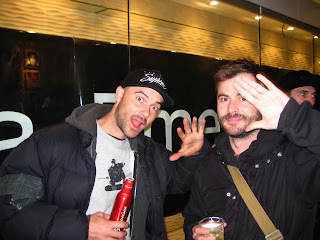 UNFORTUNATELY I COULDNT TAKE PHOTOS BECAUSE MY CAMERA BROKE.,BUT CHECK OUT SOME FOOTAGE I SNAG FROM YOUTUBE.